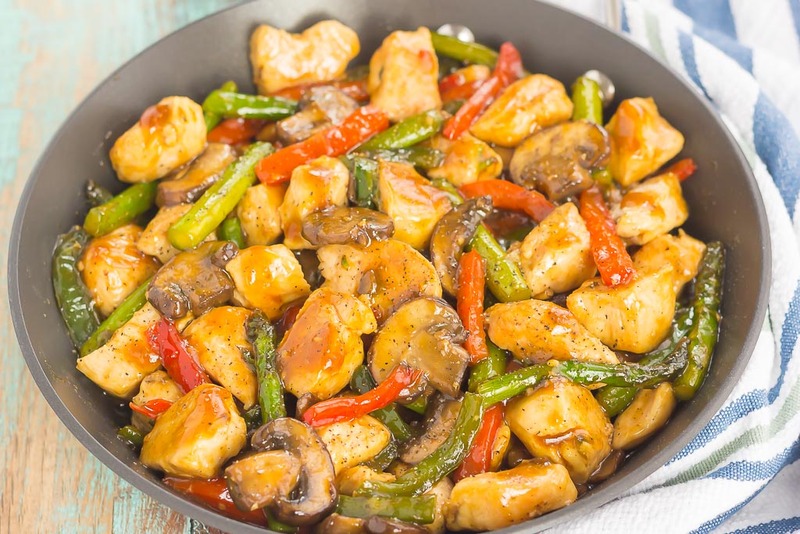 This Honey Garlic Chicken Stir-Fry is an easy, one pan meal that’s ready in just 30 minutes. Fresh veggies and chicken are tossed in a sweet and savory sauce that’s seasoned to perfection. 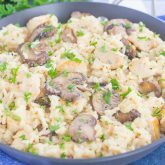 This simple meal is a dish that the whole family will enjoy! It’s time for another 30 minute meal, friends! Time is flyin’ and I’m kinda loving that the colder months are zipping on by. But, don’t get me wrong, I’m not wishing the year away. I’m just ready for it to be a little warmer and sunnier around here. So tell me, are you a fan of stir-fries? Or is it stir-frys? But, back to the point, what are your feelings about it? I am a stir-fry lover, but for some reason, I always forget about this option for dinner. Instead, it’s mostly a dish that I order out, or gasp, grab from the frozen section of the grocery store and pop into a skillet for a quick dinner. But, I’m about to change that today. 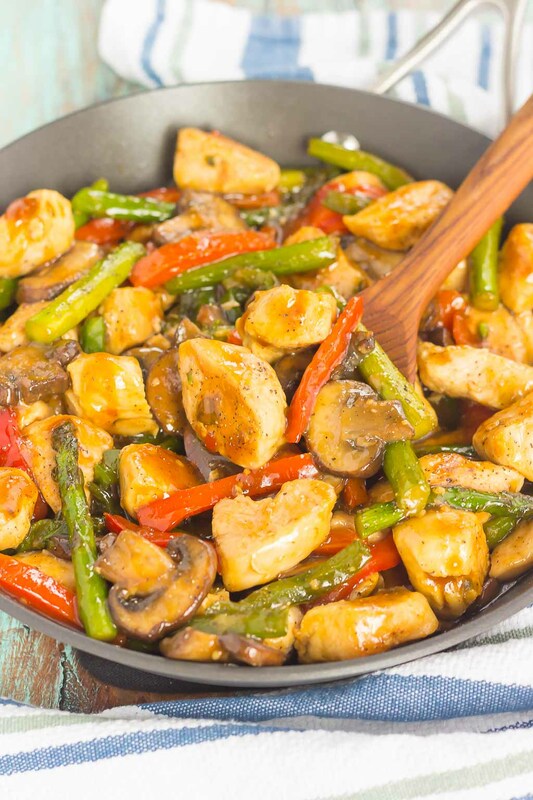 And since I love a quick and easy meal, I took on the challenge of creating this Honey Garlic Chicken Stir-Fry in just 30 minutes. That way, I have no excuse to not make a homemade version that doesn’t take a lot of prep time. And I think I created a winner, friends! Now I know that this stir-fry is nothing new, but for me, it’s one of my favorite kinds. And it has chicken in it! 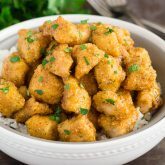 Remember from this post that I’m not the biggest fan of chicken because it’s often plain and boring to me? Well, not anymore! Now that I made my own stiry fry, I think I will definitely be skipping the takeout more often and making my own at home. It’s so easy to make, friends! So easy! Why have I not tried this before? I love the fresh asparagus, mushrooms (oh, how I love them), green pepper, and red pepper together. These veggies give this dish the perfect amount of crunch, and freshness, too! And it’s so easy to customize depending on your tastes. Don’t like asparagus? Swap it with broccoli? Love carrots in your stir fry? Add ’em in! See how easy it is? Once the veggies are cooked and tender, you’ll remove them to a separate plate and cook the chicken. In order to get that golden coloring on the chicken, try to let it cook for 4-5 minutes on each side, without moving it too much. And that sauce…let’s talk about that honey garlic sauce! It might just be my favorite kind to date. Seriously though…it’s a simple sauce that consist of chicken broth, soy sauce, honey, a touch of sesame oil, and cornstarch to thicken it up. 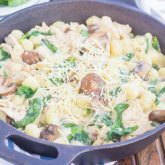 The ingredients get whisked together and then poured over the cooked chicken and veggies in the skillet. Cook until the sauce thickens and then your dinner is ready to be devoured. And if you really love the taste of this honey garlic sauce, I highly recommend doubling the amount. It’s so good when poured over rice or noodles! One bite and you’ll fall in love with the tender chicken, fresh veggies, and sweet and savory sauce. 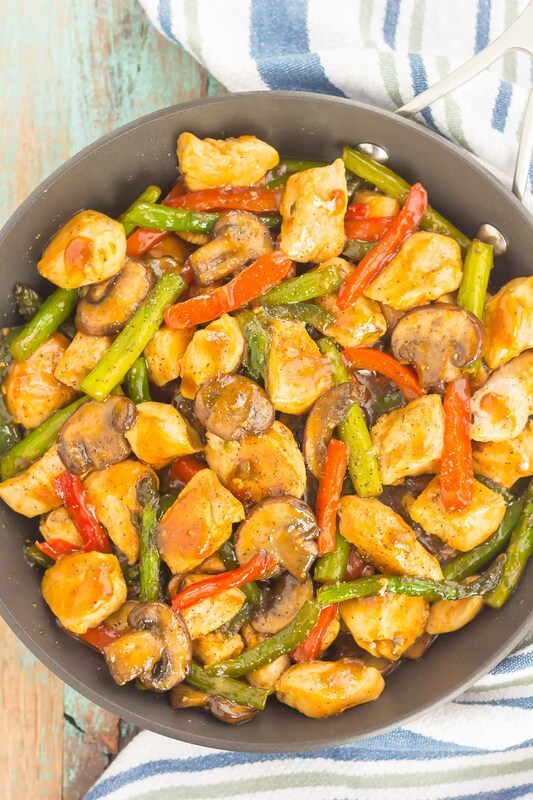 This Honey Garlic Chicken Stir Fry is sure to be a favorite all year long! Looking for more easy meals? I’ve got you covered! 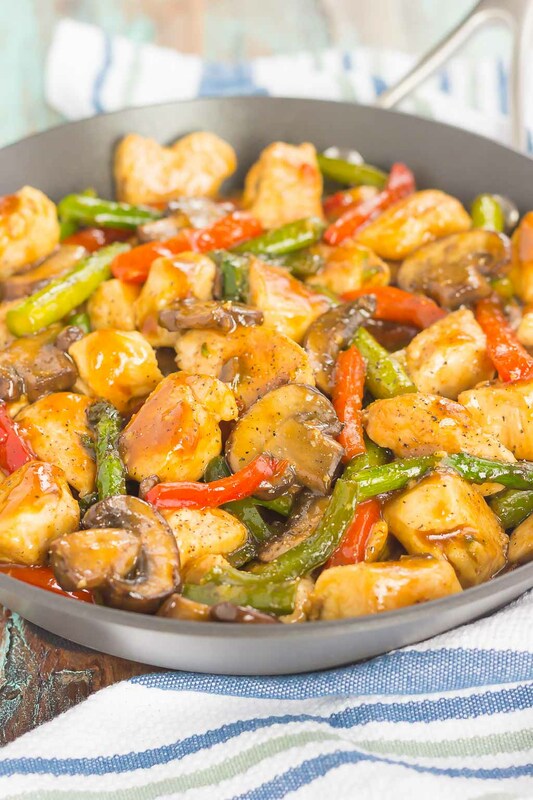 This Honey Garlic Chicken Stir-Fry is an easy, one pan meal that's ready in just 30 minutes. 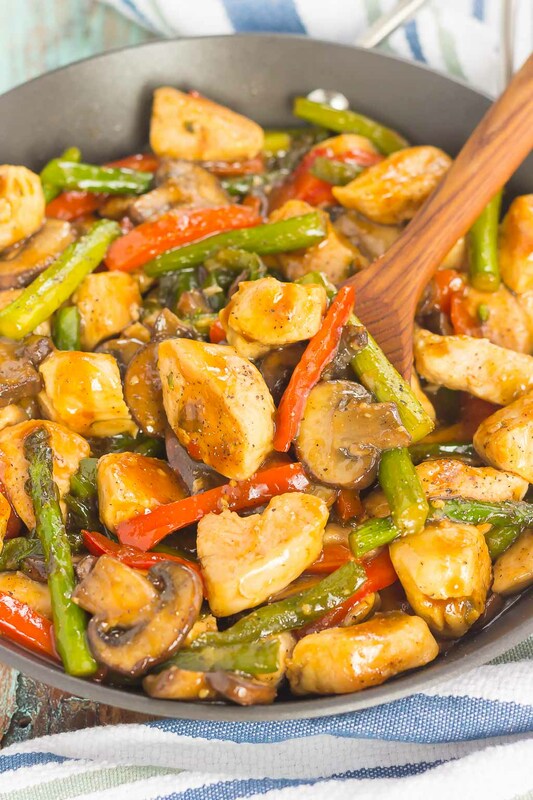 Fresh veggies and chicken are tossed in a sweet and savory sauce that's seasoned to perfection. This simple meal is a dish that the whole family will enjoy! In a large skillet, heat olive oil over medium heat. Add asparagus, mushrooms, red bell pepper, and green pepper. Season with salt and pepper. Saute until tender, about 10-12 minutes. Add minced garlic to skillet to and cook for 30 seconds. Remove veggies to a separate plate and set aside. In the same skillet, add chicken and season with salt and pepper. Cook until no longer pink, about 4-5 minutes per side. To achieve the golden color, try not to move chicken until ready to flip. While chicken is cooking, in a small bowl, whisk chicken broth, soy sauce, honey, sesame oil, and cornstarch until smooth. Add veggies back to skillet with chicken, pour honey garlic sauce over chicken and veggies, and heat until sauce is boiling and becomes thick, about 1 minute, stirring occasionally. Remove from heat and serve with white rice, if desired. I am SUCH a fan of stir-fry! It's one of mine and my boyfriend's favorite things to cook together. :) There's literally just so many flavor options! Speaking of which, I have NEVER had a honey garlic stir-fry so this one is definitely going on the dinner agenda! Aren't stir fries the best?! Thanks, Sarah! I love stir-fry dinners and sometimes forget about them too! They're so quick and easy and such a great way to clean out the fridge. :) This has so many ingredients I love Gayle! I LOVE STIR FRYS! THIS ONE LOOKS SO COLORFUL AND DELICIOUS! CAN'T WAIT TO TRY IT! I am a stir-fry-aholic when it comes to dinner! haha I make them ALL the time - so quick and easy! This honey garlic version sounds delicious!! It sure is! Thanks, Ashley! You've got a lot of good flavors going on in your stir fry, it sounds terrific. It's a favorite of mine, Karen! Can you use frozen vegetable? Hi Carol! I haven't tried it with frozen vegetables, but I would think it would work. You will probably need to adjust the cooking time then. 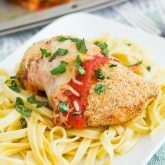 I made this for dinner tonight and it was a winner for our family! I added extra soy sauce and honey because I didn’t realize seasame oil was such a bold flavor.. I saute’d my vetables quite a bit because we prefer a more tender bite than a crunchy.. all in all a great meal! I'm so glad you liked this, Krista! Thanks for stopping by and letting me know how it turned out!